My response to Millie, the proprietor of Ms. Logica, regarding the three things I'd take to a desert island is up. Go take a look, and I'm curious: what would you take? 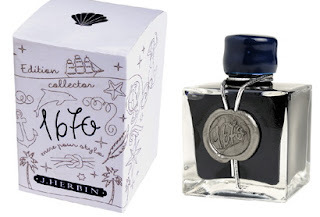 J. Herbin's new addition to the 1670 Anniversary line is Bleu Ocean, a great complement to their 1670 Rouge Hematite. Like it's sister ink, Bleu Ocean's packaging is fun and elegant, touching on M. Herbin's travels as a sailor to India and other places on the Spice Trade. I was curious to see how the Bleu Ocean compared to Diamine's new Sargasso Sea, and was surprised at the closeness of the colors. Sargasso Sea does seem to have a deeper hue, but Bleue Ocean is very close. Both samples were swabbed twice, to really layer the color and look for differences/similarities. I loved writing with this ink, especially in My Noodler's Ahab Flex fountain pen (which writes much better once I trimmed the feed). I think the Bleu Ocean will become one of my go-to inks that I'll keep in one of my pens at all times for immediate use. Drying time wasn't an issue, but that could be the Rhodia paper. If you find Bleu Ocean, grab a bottle and enjoy this beautiful blue ink. 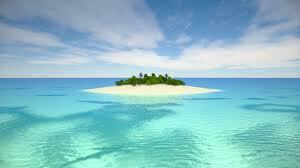 Desert Island Blogs--Which Three Would You Take? Millie at mslogica has started a new series featuring bloggers from her blog roll, asking for their three "must have" items for desert island survival. She originally contacted me in June, but I was working on this little project (yes, I'll spring it on you one more time) and, unfortunately, forgot. She didn't, however, and sent me another request for my thoughts. Pocket Blonde's Three will be appearing in the weeks to come, but Azizah at Gourmet Pens has started off the series. Do go over and take a look, it's going to be a fun thought experiment. 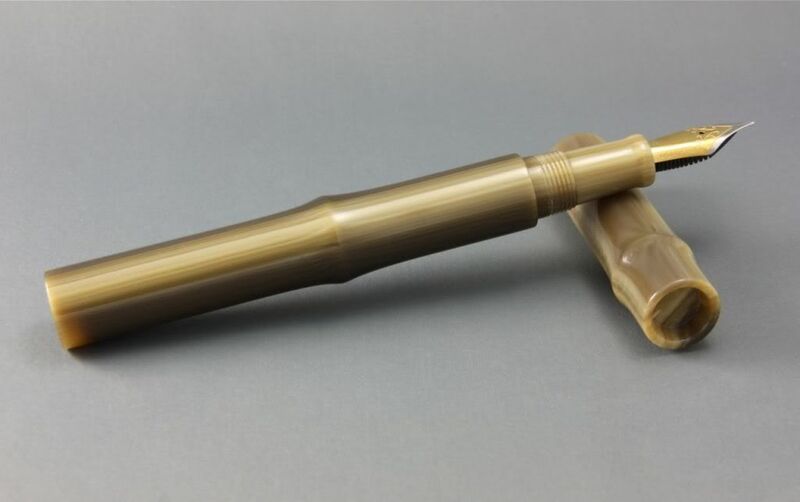 Ken Cavers designs and makes custom fountain pens (and custom flyfishing rods, too), and I have to say I'm really take with his signature Bamboo design. Check out his blog (I love the banner pic pen), the nib adjustment post is a great guide for the faint of heart like me. 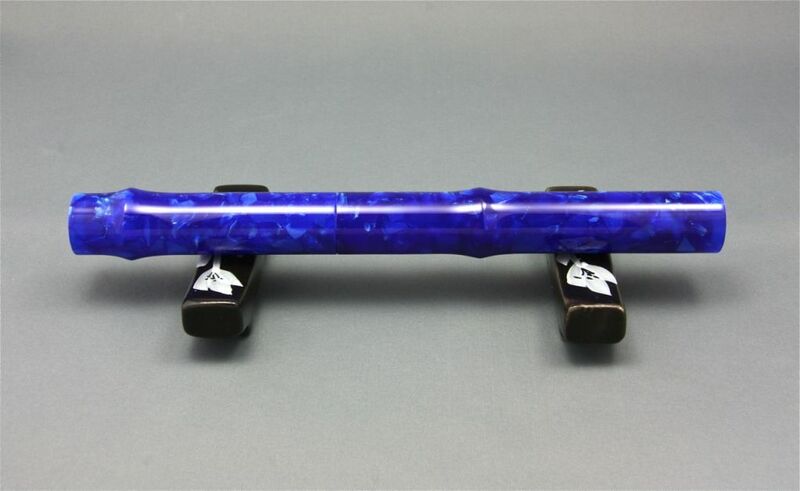 Some months back a reader emailed about the Nemosine Singularity fountain pen, and when an Amazon.com gift card started burning a hole in my pocket I decided to add one to the cart (and the $15 price was too good to pass up). I chose the Demonstrator model with a German fine nib, very happy to see in the description that it came with both cartridges and a converter. This is a good-looking pen. Spare and elegant, with a few touches that aren't flashy or annoying, such as the top of the cap coming to a very slight point. When I started writing with it, my first thought was that the nib shaded more towards a medium than a fine. As that's not my usual nib preference, I put the pen away for a few days and went to fill a few others to use. Going through my pen tray though, I pulled out several medium nibs I do have, as well as a few other demonstrators, and decided to see how the Singularity stacked up against them. The Nemosine actually does quite well against its more expensive cousins. The capped pen measures almost 5.5 inches, just a bit bigger than the Artista but shorter than the Custom 74 and TWSBI in the above picture. Posted, the Nemosine is just a shade under 6 inches, and again it compares well to the other Demonstrators. But what about the medium nib, how does that hold up? The Nemosine has a very large nib, one of the biggest in my collection. The only nib I have that is a match is my Pilot Namiki Custom 823. The larger nib does look a little strange on the smaller Singularity, a bit over-engined for its hull you might say. But it is impressive, and I found that it writes very well. I didn't have any of the usual dry-starts or skipping, and it has good hand-feel--not too heavy or too light, pretty well balanced, and overall very easy to use. I love the box it came in, with the Morse Code on the lower left spelling out "memory." Nemosine is a variation of Mnemosyne, the Greek goddess of memory and the mother, by Zeus, of the nine Muses. The back spells out the details: the pens are made overseas, but their US home is Pittsburgh, PA. I like that someone actually wrote on the box. ** To forego a bunch of fancy legal jargon, we must reserve the right to rescind our warranty offer at any time, at our sole discretion, without notice. We certainly don't foresee any chance of resorting to this kind of action... but instead of paying a lawyer buckets of money to state the same thing within 3 pages of legal jargon, we figured we'd just protect ourselves by saying it outright. But what about the nib line width, which seems more like a medium rather than a fine? I got out a few other mediums I own, as well as two other fines, and tested them out. The Waterman Hemisphere was definitely wider than the Nemosine, and the Faber-Castell Ambition was just a touch wider as well. What surprised me was comparing the Nemosine Singularity to a Lamy Safari and Nakaya Decapod Twist, both fine nibs (for the latter, in every sense of the word). The Nemosine wasn't that much wider than either of them, an almost undetectable hair's breadth of thickness. So my initial reaction was definitely off, and the Singularity's fine nib really is a fine line. This is a great pen at an amazingly low price, with different color and nib options that should keep most people happy. I'm not sure if the pen is in any retail shops (they never got back to me, alas), but if you're inclined to buy one then Amazon.com is your best bet. I can't think of a better pen at this price, and it's a great addition to the daily arsenal.